Ben Scott – Ben received his Bachelor of Arts in Biology from Occidental College. 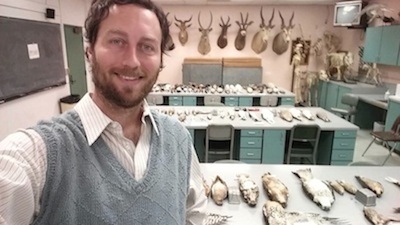 While at Occidental, Ben worked in the Moore Lab of Zoology with John McCormack on phylogeny and trait evolution of New World Jays. Ben also spent some time working at the Western Foundation of Vertebrate Zoology, home of the largest egg collection in the world. 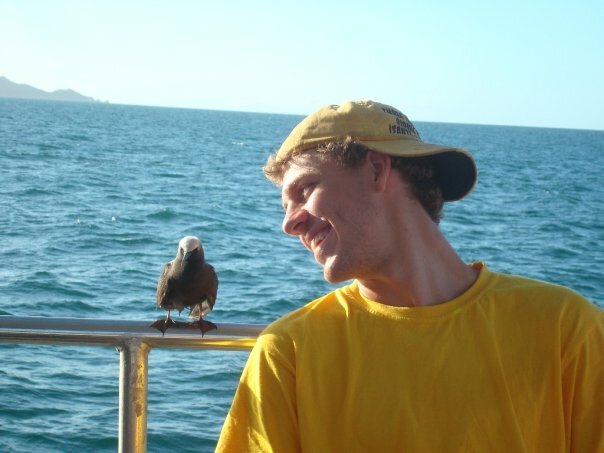 For his MS thesis, Ben is working on cardinal phylogenetics and plumage evolution. 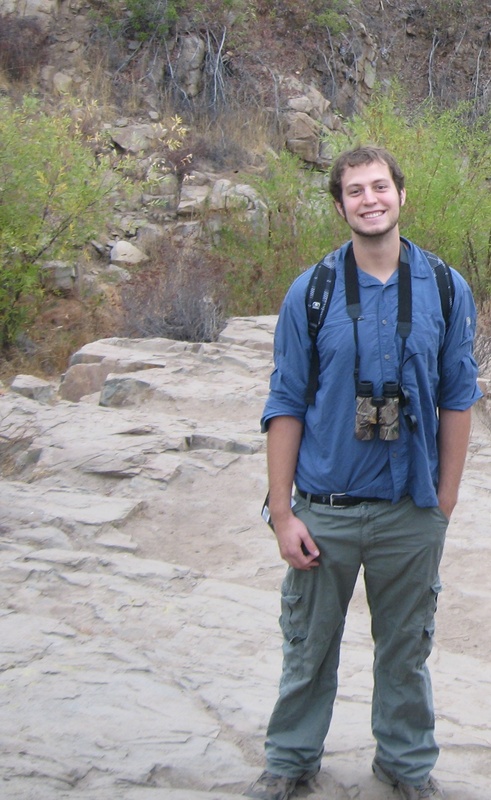 Nick Vinciguerra – Nick received his Bachelor of Arts in Ecology and Evolutionary Biology from the University of Colorado Boulder. 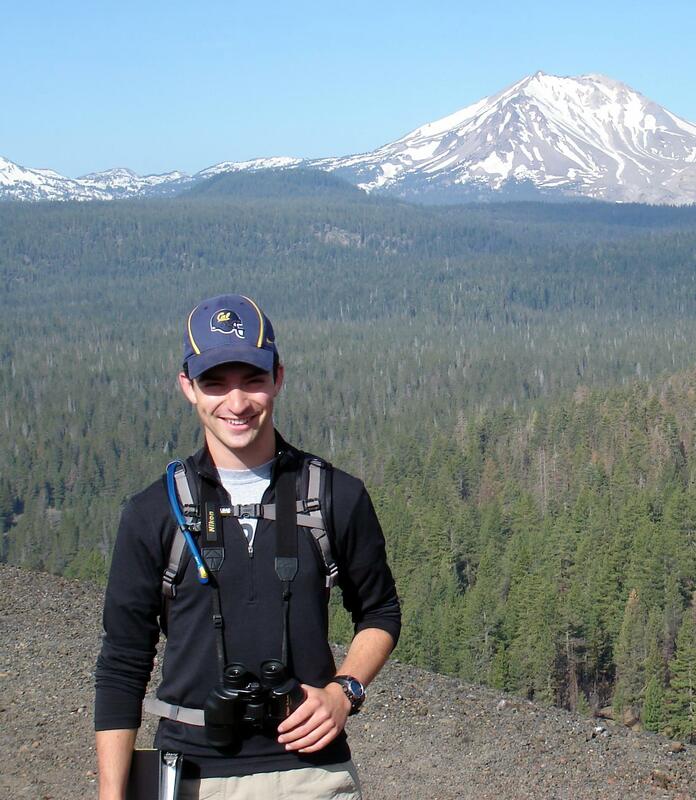 After graduating, Nick worked at the Institute of Arctic Biology in Alaska, the Smithsonian Tropical Research Institute in Panama, and in the lab of John McCormack at Occidental College. 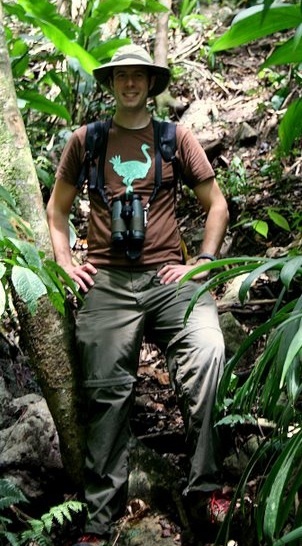 For his MS thesis, Nick is working on ecology and evolution of tanagers using 3D images of their bills. Rosalyn Price-Waldman – Rosalyn received her Bachelor of Arts in Biology (with honors) from Brown University. Rosalyn’s undergraduate thesis focused on phylogenetics and comparative wing morphology in bats. For her MS thesis, Rosalyn is building a new phylogeny for tanagers using genomic data and using that phylogeny to investigate natural and sexual selection in tanagers. 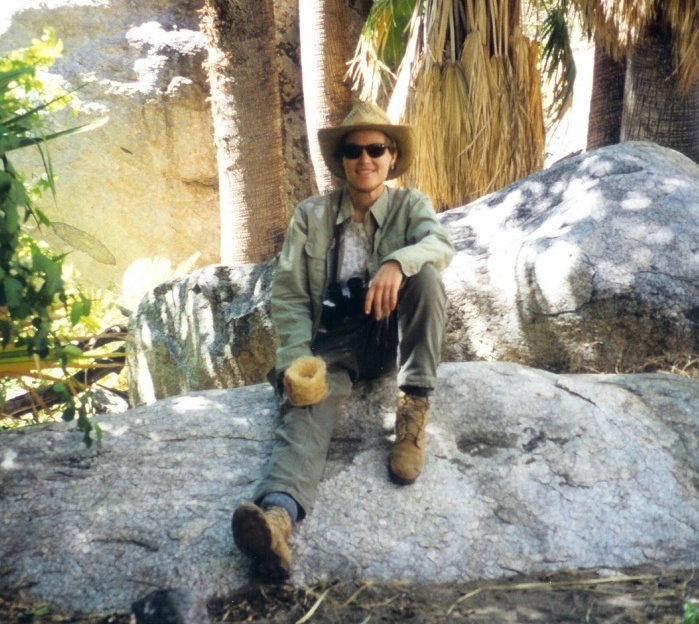 Brian Myers – Brian received his BS in Environmental Biology from California Polytechnic State University in Pomona. For his PhD project, Brian is studying behavior, morphology, and genetics in two hummingbird species, the Rufous and Allen’s Hummingbirds. In particular, he is focusing on a hybrid zone between these two species. In addition, he is investigating the phylogeography of the Allen’s Hummingbird. Dr. Lori Hargrove – Lori Hargrove received her PhD from the University of California at Riverside. For her dissertation, she investigated how avian distributions have shifted along an arid elevational gradient in response to climate change. She is currently working with colleagues at the San Diego Natural History Museum on the San Jacinto Mountain Centennial Resurvey project. 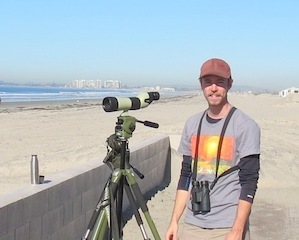 This project is surveying vertebrate species at sites in southern California, 100 years after they were documented in detail by Joseph Grinnell and colleagues from the Museum of Vertebrate Zoology at the University of California Berkeley. In addition, Lori has a long-standing interest in the biology of the Gray Vireo (Vireo vicinior) and recently completed a study of its nesting success. Undergrad Researchers: For Spring 2019, Michael Jimenez and Aubtin Rouhbakhsh are working in our lab, assisting Brian Myers with his hummingbird project. 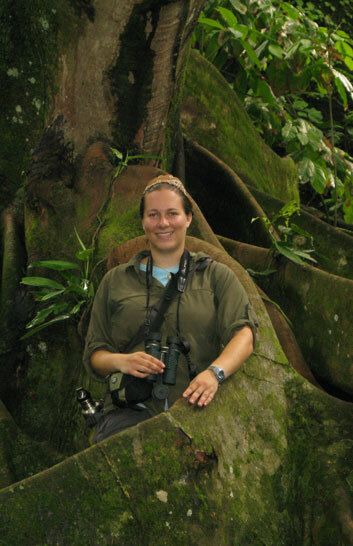 Amelia Demery – For her MS thesis, Amelia investigating morphological evolution in the tanagers. In particular, she investigated how bill shape and other morphological characters may correlate with speciation rates across the group. She finished her MS in 2018 and is currently working on a PhD at Cornell University in the lab of Irby Lovette. Funk, E. R. and K. J. Burns. 2018. Biogeographic origins of Darwin’s finches (Thraupidae: Coerebinae). The Auk: Ornithological Advances 135: 561-571. Funk, E. R. and K. J. Burns. in press. Evolutionary distinctiveness and conservation priorities in a large radiation of New World birds (Emberizoidea). Animal Conservation. Shannon Walsh – For her MS thesis, Shannon studied the conservation genetics of the Spotted Towhee (Pipilo maculatus) on California’s Channel Islands. Two subspecies of the towhee occur on the Channel Islands, the mainland subspecies and an island endemic subspecies. Using DNA sequence data, she studied the evolutionary history of the towhees on the islands and evaluated their genetic and morphological distinctiveness. Shannon received funding for her project from the Chapman fund of the American Museum of Natural History, a Ralph W. Schreiber Award from the Los Angeles Audubon Society, and a grant from SDSU. Shannon finished her MS thesis in 2015. Klicka, L. B., B. E. Kus, P. T. Title, and K. J. Burns. 2016. Conservation Genomics reveals multiple evolutionary units within Bell’s Vireo (Vireo bellii). Conservation Genetics 17: 455-471. Ryan, P. G., L. B. Klicka, F. K. Barker, and K. J. Burns. 2013. The origin of finches on Tristan da Cunha and Gough Island, central South Atlantic ocean. Molecular Phylogenetics and Evolution 69: 299-305. Mason, N. A., Burns, K. J., Seddon, N., Tobias, J., Claramunt, S., and E. P. Derryberry. 2017. Song evolution, speciation, and vocal learning in passerine birds. Evolution 71: 786-796. Burns, K. J., P. Unitt, N. A. Mason. 2016. A genus-level classification of the family Thraupidae (Class Aves: Order Passeriformes). Zootaxa 4088: 329-354. Mason, N.A. and K. J. Burns. 2015. The effect of habitat and body size on the evolution of vocal displays in Thraupidae (tanagers), the largest family of songbirds. Biological Journal of the Linnean Society 114: 538–551. Mason, N. A., P. O. Title, C. Cicero, K. J. Burns, and R. C. K. Bowie. 2014. Genetic variation among western populations of the Horned Lark (Eremophila alpestris) indicates recent colonization of the Channel Islands off southern California, mainland-bound dispersal, and postglacial range shifts. The Auk: Ornithological Advances 131: 162-174. Burns, K. J., A. J. Shultz, P. O. Title, N. A. Mason, F. K. Barker, J. Klicka, S. M. Lanyon, and I. J. Lovette. 2014. Phylogenetics and diversification of tanagers (Passeriformes: Thraupidae), the largest radiation of Neotropical songbirds. Molecular Phylogenetics and Evolution 75: 41-77. Mason, N. A. and K. J. Burns. 2013. Molecular phylogenetics of the Neotropical Seedeaters and Seed-finches (Sporophila, Oryzoborus, Dolospingus). Ornitología Neotropical 24: 139-155. Title, P. O. and K. J. Burns. 2015. Rates of climatic niche evolution are correlated with species richness in a large and ecologically diverse radiation of songbirds. Ecology Letters 18:433-440. Shultz, A. J. and K. J. Burns. 2017. The role of sexual and natural selection in shaping patterns of sexual dichromatism in the largest family of songbirds (Aves: Thraupidae). Evolution 71: 1061-1074. Shultz, A. J. and K. J. Burns. 2013. Plumage evolution in relation to light environment in a novel clade of Neotropical tanagers. Molecular Phylogenetics and Evolution 66: 112-125. Burns, K. J. and A. J. Shultz. 2012. Widespread cryptic dichromatism and ultraviolet reflectance in the largest radiation of Neotropical songbirds: implications of accounting for avian vision in the study of plumage evolution. The Auk 129: 211-221. Mauck, W. M. and K. J. Burns. 2009. Phylogeny, biogeography, and recurrent evolution of divergent bill types in the nectar-stealing flowerpiercers (Thraupini: Diglossa and Diglossopis). Biological Journal of the Linnean Society 98: 14-28. Sedano, R. E. and Burns, K. J. 2010. 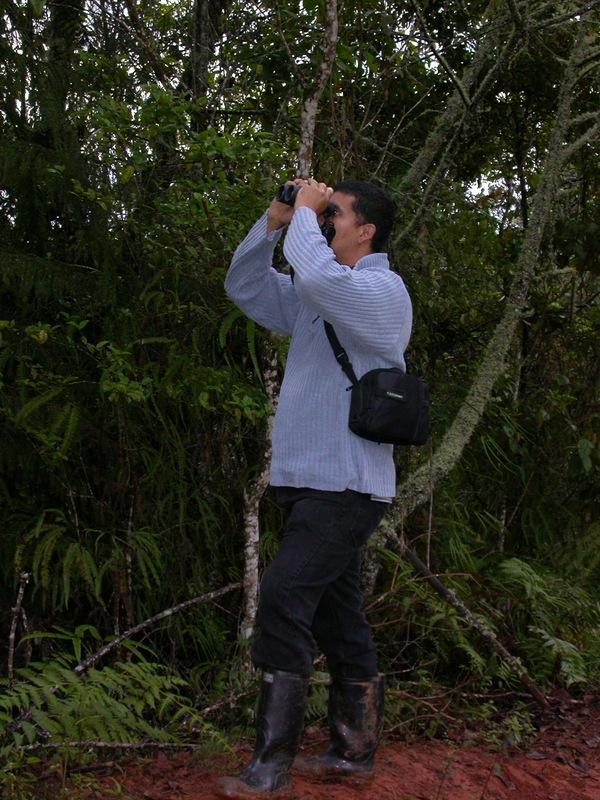 Are the Northern Andes a species pump for Neotropical birds? Phylogenetics and biogeography of a clade of Neotropical tanagers (Aves: Thraupini). Journal of Biogeography 37: 325-343. Shepherd, T. M. and K. J. Burns. 2007. Intraspecific genetic analysis of the Summer Tanager (Piranga rubra): Implications for species limits and conservation. Journal of Avian Biology 38: 12-27. Alexander, M. P. and K. J. Burns. 2006. Intraspecific phylogeography and adaptive divergence in the White-headed Woodpecker. The Condor 108: 489-518. Burns, K. J., M. P. Alexander, D. N. Barhoum, and E. A. Sgariglia. 2007. A statistical assessment of congruence among phylogeographic histories of three avian species in the California Floristic Province. Pages 96-109 in Festschrift for Ned K. Johnson: Geographic Variation and Evolution in Birds (C. Cicero and J. V. Remsen, Jr., Eds.). Ornithological Monographs, no. 63. Sgariglia, E. A. and Burns, K. J. 2003. Phylogeography of the California Thrasher (Toxostoma redivivum) based on nested-clade analysis of mitochondrial-DNA variation. The Auk 120: 346-361. Burns, K. J. and D. N. Barhoum. 2006. Population-level history of the wrentit (Chamaea fasciata): Implications for comparative phylogeography in the California Floristic Province. Molecular Phylogenetics and Evolution 38: 117-129. Barhoum, D. N. and K. J. Burns. 2002. Phylogenetic relationships of the Wrentit based on mitochondrial cytochrome b sequences. The Condor 104: 740-749. Sharp, B. L. and B. E. Kus. 2006. Factors influencing the incidence of cowbird parasitism of Least Bell’s Vireos. Journal of Wildlife Management 70: 682-690. Sharp, B. L., B. L. Peterson, and B. E. Kus. 2005. Puncture ejection of own egg by Least Bell’s Vireo and potential implications for anti-parasitism defense. Western Birds 36:64-66. Sharp, B. L. and B. E. Kus. 2004. Sunrise nest attendance and aggression by Least Bell’s Vireos fail to deter cowbird parasitism. Wilson Bulletin 116: 17-22. Former Undergraduate Researchers: We have benefited from the help of many talented undergraduate students in the lab over the years. Thank you for your help and hard work! Brandon Lebeiko, Jessica Plein, Amanda Miller, Samantha Wynns, Alan Obando, Nicco Eck, Morgan Reed, Zach Martinez, Jeff Moore, Andre Nguyen, Allan Cabrero, Erik Funk, Cate Threlkeld, Josh Espinoza, Annabelle Bernabe, Heather Macdonald, Ryan House, Matt Faughender, Angel Dufrane, Sarah Tulley, Ashley Lane-Roberts, Ian Maunsell, Celesta Cates, Maria Gonzalez, Tommie Ebanez, Ben Tambaschi, Shannon Drake, Kimo Rogalo, Mike Guerreiro, Amanda Sommerfield, Laura Rollefson, Beth Kennedy, Matt Alexander, Mike Machado, Shera Finn, Sarah Curry, Steve Sullivan, Valda Mestas-Romero, Jamie Mascarin, Marisa Giometti, Rodolfo Figueroa, Rachel del Rio, Tara Cahill, Pam McGlynn, José Guarderas, Jason Gross, Heather Davis, Rick Combs, and Jason Bornholdt.